Archaeologists have discovered a rare stone altar during excavations in the north of Guatemala, which belonged to the ancient Maya. The artifact is written text, which describes the policy of the rulers of the Kingdom of Canulah in the middle of the VI century. This is reported in a press release on Phys.org. 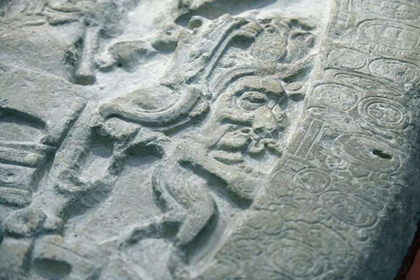 The altar was found among the jungle, in the ruins of the temple of the ancient Mayan city of La Corona, discovered in 1996. The size of the slab made of limestone is 1.46 by 1.2 meters, weight – more than a ton. A sample of the Mayan hieroglyphic letter is dated May 12, 544. The text tells of the previously unknown ruler of the Kingdom of Canulah named Chak Took Ich’aak, whose residence was in La Corona. According to scientists, the find indicates that the dynasty of the rulers of Kanul carried out successful expansion into the lands that belonged to the Mutul kingdom. They defeated their rivals in 562, which allowed them to rule unchecked in the Maya lowlands (south-eastern part of Mesoamerica) for two centuries.